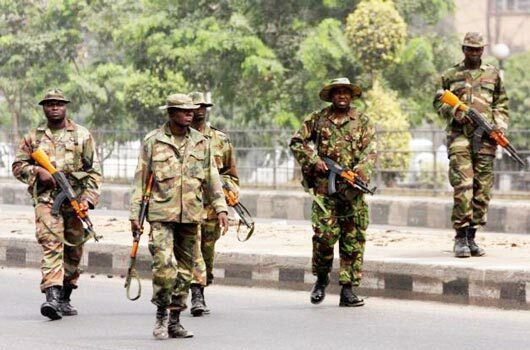 Troops of 5 Battalion, 16 Brigade of the Nigerian Army, Yenagoa, Bayelsa State, have arrested 15 gunmen believed to be political thugs with plans to disrupt the presidential and National Assembly election in the state. Army Deputy Director, Major Jonah Danjuma, who disclosed the arrest in a statement, said the troops in their determined efforts to ensure peace and security in their area of responsibility apprehended the gunmen at Ikebiri in Southern Ijaw Local Government Area of the state. “It was a successful operation that led to the recovery of large cache of arms, ammunition and other items. This feat was achieved as a direct response by vigilant troops in Operation SAFE CONDUCT 2019 in 16 Brigade Area of Responsibility. There are indications that the armed men are highly suspected to be political thugs who planned to disrupt the presidential and National Assembly elections in the Southern Ijaw LGA of Bayelsa State,” Danjuma added. According to him, items recovered include one General Purpose machine gun, two 200 Horse Powered speedboats, large quantity of ammunition, 16 mobile phones and seven handheld Motorola radio. Others include five Motorola battery chargers, three wrist watches, five torch lights, four identify cards and N16, 000 naira only. He said all those arrested would be handed over to the Nigerian Police after initial interrogation for necessary action.